No place does holidays better than Fort Lauderdale! No matter what time of year you visit, there’s always a fun seasonal event taking place. The winter season is particularly wonderful here; at this time of year, the weather is pleasant and spirits are high. One of the best ways to celebrate is Christmas on Las Olas! We’ve compiled everything you need to know about this festive event. Before arriving in beautiful Fort Lauderdale, you’ll want to know the best places to eat, drink, and be merry. Our free Fort Lauderdale Vacation Guide is the solution! Request access today and we’ll send you our favorite restaurant, bar, spa, and retail recommendations! That way, you’ll be ready to enjoy even more than Christmas on Las Olas! Christmas on Las Olas is a true celebration of South Florida’s holiday season. Beginning in late November each year, this free, festive event is open to the public. The festival takes place between S.E. 6th Avenue and S.E. 11th Avenue, where over 50,000 visitors revel in plenty of fun activities, great food, and lively entertainment. It’s a Fort Lauderdale tradition that has been cherished for over 50 years! The best part about this beloved event is its inclusive nature. In addition to the twinkling Christmas lights decorating the branches of the Boulevard’s tropical trees, there will be a brightly lit menorah centerpiece on display to celebrate Hanukkah. Fort Lauderdale is a very welcome city, so all are invited to enjoy this upbeat festival! The attractions offered at Christmas on Las Olas help secure its place as one of the most highly anticipated annual events in South Florida. As floating faux snow creates a stunning scene in the air, pedestrians discover streetside activities like a sculpted mini mountain made of ice (perfect for little ones to sled down), a giant screen playing beloved Christmas movies, plenty of live music, and much more. A walk down Las Olas Boulevard during this festival will delight the entire family! One of the most anticipated parts of Christmas on Las Olas is the live entertainment. Four performance stages that provide non-stop family entertainment. More than 35 local choirs and bands fill the air with the sounds of the holidays as attendees roam through exciting booths, shops, and activity areas. In addition to spectacular seasonal offerings, this festival features easy access to the Boulevard’s countless specialty shops, local boutiques, art galleries, restaurants, and bistros that all offer unique products perfect for satisfying the pickiest of people on your holiday shopping list! There will even be over 70 food vendor booths and several outdoor bars where visitors can quench their thirst with some true “holiday spirits!” Local bars like Big City Tavern, American Social, and Luigi’s Tuscan Grill will be represented. Be sure to shop ‘til you drop, because local shops will be open late for the duration of the event. 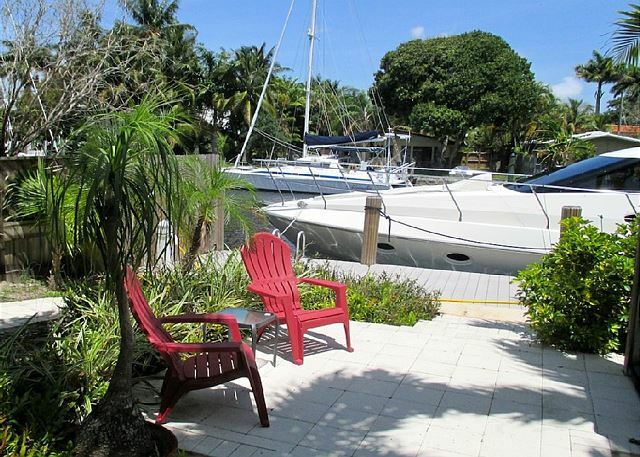 Stay Nearby in a Fort Lauderdale Stays Vacation Rental! Instead of staying in a hotel, add some local flair to your holiday getaway and book a private Fort Lauderdale Stays rental home! Our unique Las Olas properties are just minutes from vibrant Las Olas Boulevard and have great amenities like fully stocked kitchens, heated pools, and complimentary Starbucks coffee. They even feature stunning views of shimmering canals and tropical foliage! Ready for the South Floridian holiday getaway of your dreams? Check our availability today and start looking forward to some of the best holiday shopping and festivities!